Hexacopter Typhoon H Pro is a huge improvement compared to the previous versions like Yuneec Typhoon H and Q500 4k. Typhoon H Pro comes with a lot of power because it has 6-rotor blades. Meaning extra 2-rotor blades were added to the H Pro. Previous versions had 4-rotor blades. The 6-rotor blades make the drone to keep floating in the air even if there is an engine problem. No matter what, it is not possible for 6-rotor blades to fail at the same time. So, safety is assured with the Typhoon H Pro. The drone camera rotates effortlessly. The wonderful part of the design is that the camera is well fitted in front of the drone. It is a big leap forward in terms of the camera capabilities. There are genuine reasons to go for Typhoon H Pro compared to other drones in the market because of its innovative hi-tech design and fascinating technology that you can hardly find in other drones in the market. The drone is very portable due to the fact that it comes with a backpack to put in everything. The backpack makes the drone to be very easy to carry around without much stress. Typhoon H Pro is a delight to lovers of drones. The measurement is almost 20.5×12.2×18 inches when the arms of the rotors are rolled up. When the rotors are spread out, the drone becomes larger due to the extension of the wings. The drone is configured with the latest Real Sense technology from Intel. It comes with extra batteries. It also comes with a remote control. It comes with the ST16 remote control, a retracting landing gear, strong propeller, and a good camera stabilizer. The camera turns very easily in different directions by rotating constantly. The beauty of the drone is that the landing gear is well raised up so that nothing obstructs your view as you fly. A giant leap was accomplished with the Typhoon H Pro drone compared with former versions which have their power button at the bottom of the drone. The H Pro has its power button at the top of the drone. This is a wonderful improvement. H Pro arms are made of carbon fiber. The arms can easily be folded so as to fit into the drone’s backpack. It is so easy to lift each arm so that they can be well placed. The design of the propeller made it so easy to use compared to the old propellers which have threads. The propeller is designed in such a way that it can be easily twisted and locked up. Also, the buttons on the propeller can be twisted easily too but have to be pressed down so as to twist it before it can be removed. Yuneec Typhoon H Pro battery enters into the back of the drone very easily. That is a remarkable departure from the former versions where the battery section is very tight. Removing the batteries is super easy. You can also change the batteries easily too. Take note that after the drone has flown for some time, the battery becomes hot; but it does not affect the performance of the drone in any way. Yuneec Typhoon H Pro comes with an ST16 remote control as earlier mentioned. Its measurement is close to 6.5x13x2 inches. It comes with an ST16 sunshade to protect you from the danger of the sun so that you can have a perfect viewing with its 7 inch LCD screen when flying outside. Adding a sunshade to the package is a marvelous idea because sun rays can seriously disturb viewing. The remote control has different switches; in addition to the touchscreen functions. Using the remote control can be very challenging especially for new pilots, but with time, they will master everything. The drone itself comes in a brilliant black color that you cannot resist. 4k drone camera Typhoon H Pro comes with double sticks. The drone can be easily controlled using the double sticks. The right stick is used to direct the drone to the direction that you want; while the left stick takes care of altitude. On the right side of the drone is a throttle that controls speed by setting a speed limit. The throttle is far easy to use compared to the previous versions of the drone. The camera rotates so freely and can be tilted easily by just a dial. The rotation can be stopped by just clicking a dial. The drone has different switches for different purposes. There are switches that control the landing gear either up or down, change flight direction, and there are buttons that take care of starting and stopping the video, take photos and switch on or turn off the engine of the drone. 4k drone camera Yuneec Typhoon H Pro has a 7-inch touchscreen which comes with Android 4.4.4 software. The software is up-gradable. The display on the screen is very clean and sharp. Streaming through the camera of the drone is pleasant for viewing. The camera can be operated using another remote control when it is in Team mode. This makes it possible for the user to be able to fly the drone, while another person can use the camera to shoot in mid-air. When the drone is in Orbit mode, the camera rotates at 360 degrees at the top of the drone. The combination of Follow Me mode and Orbit mode are of immense benefit when trying to record the footage from a particular angle. With this, the user can easily do good aerial coverage. There are 4 controls that are below the screen which response through touch. They are Model Select, the Pad, Channel Settings, and System Setting. For example, the Pad Setting is what will take you to the Android 4.4.4 Home Screen. You can watch the recordings of the camera when you press “Play” on the screen. You can also save the recording using a micro SD memory card. You can easily change the camera setting which is on the bottom right side of the screen interface. Just like other previous versions of the Yuneec drones, Typhoon H Pro has 3 flight modes. They are Home, Smart, and Angle. The Angle helps you to be in control of the drone; Smart is responsible for changing the light to green; the Home turns the light to a blinking red. H Pro comes with a wizard that is a remote for controlling the direction of the drone. For the best result, make use of the ST16 remote control which is the main remote control for the drone. 4k drone camera Typhoon H Pro obviously beats all other drones when it comes to performance. Using the ST16 remote control, the drone can fly more than 2,000 feet from its base. But in very populated areas, it can fly at over 1,500 feet. The performance is a big success whether in crowded places or open areas. This performance gives confidence even if you are flying where there are structures that may hamper communication. 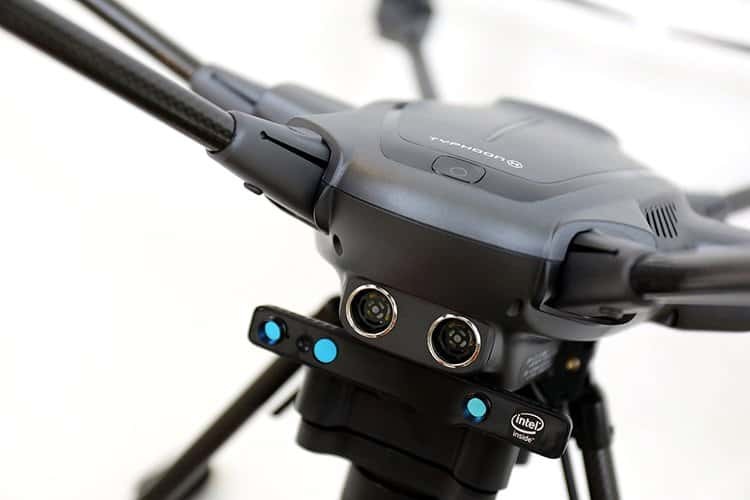 Of course, the Intel Real Sense technology ensures that even if you fly the drone far beyond the normal range, it will definitely return you back to base with ease. The drone has an inbuilt GPS system that warns of hazards like when on the road, and around nearby buildings; which helps to prevent you from flying at that moment. 4k drone camera Typhoon H Pro can fly for up to 23 minutes when the batteries are fully charged. The drone comes with the normal car charger. The car charger is included in the package in case you are away from home; you can charge it with your car and keep the drone functioning perfectly. It takes 1 hour 50 minutes for the batteries to be fully charged. With its Real Sense technology, the drone will halt flying if it senses danger ahead of you. After stopping, it will still find its way out of danger zone. That is great! Real Sense technology is wonderful in many ways. It guarantees safety. One thing that it does that is worthy of mentioning is that when it is getting closer to an obstacle, the drone’s Real Sense system let you know from far distance. It is a great tool that helps to negotiate through dangerous areas when you are flying. Typhoon H Pro comes very sophisticatedly with its latest CG03+ gimbal camera. The CG03+ gimbal camera is an upgraded version of CG03 that was fitted in previous versions like the Q500 4k. The drone camera can record on different formats like 4k DCI, 4k UHD, 1080p or 1440p. 4k UHD is the best because it has a ratio of 16:9. This ratio matches with every television sets in case you want to watch the recordings on your DVD. The quality of the video is far better this time compared to the older CG03 which was used in previous versions of the Yuneec drones. Hopefully, the next camera will outshine CG03+ with more advancement. The camera has a 400 meters transmission range. 4k drone camera Typhoon H Pro comes in 4 different video modes just like the previous versions. The modes are Raw, Night, Natural, and Gorgeous. When in Natural mode, the colors are sharp and visuals are very crispy which shows great technology improvement with Typhoon H Pro drone. There is a remarkable difference between Natural and Gorgeous modes. The difference is that Gorgeous is in saturated colors while Natural mode comes in full life colors. The Night mode is perfect for shooting at night. It is good that those who want to shoot at night were not deprived. Raw is not in compressed form and does not come in colors. 4k drone camera Typhoon H Pro hexacopter video still images are in JPG format like other versions. The images are of high quality like the pictures taken with other sophisticated cameras. 4k drone camera Typhoon H Pro hexacopter is a giant leap in many aspects. Its 6-rotor blades make the performance to be very superb. Yet, it is smaller when compared to the previous versions which are bigger in size. The ST16 remote controller comes with a bigger screen for better viewing, and it has good antennas. The camera is very lovely, and the quality of the video is incredibly awesome. 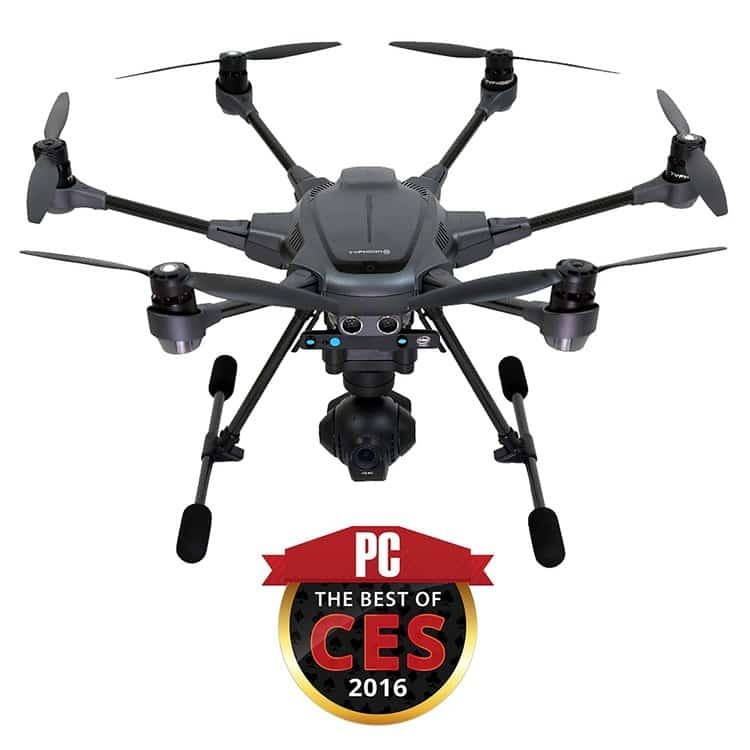 H Pro hexacopter is one drone you won’t regret buying because of its latest technology advancements. It is great value for money. Without mincing words, the Yuneec Typhoon H Pro justifies its price in the market. It is the best drone because it is fitted with all the tools and technology that its competitors have and much more. These hexacopter drones serve the purpose of safety, enjoyment, and reliability. The drone can be called a hexacopter because it is a mini helicopter by all standards. The addition of extra 2-rotor blades makes it a leader in the drone industry. It is the best. Don’t take my words for it; you just have to experiment it.